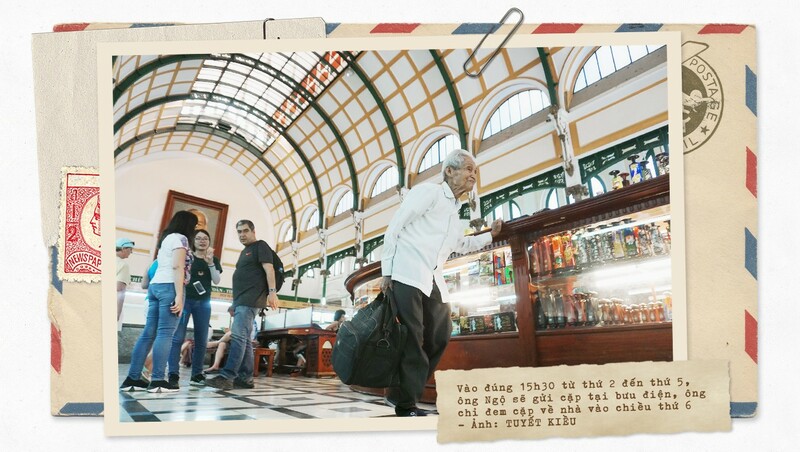 The Central Post Office in the heart of Ho Chi Minh City, one of the city’s most well-known landmarks, doubles as the workplace of 89-year-old Duong Van Ngo, the ‘last public writer’ in the southern metropolis. Ngo has occupied a little corner of the building for the past 30 years, arriving promptly at eight o-clock each morning to start his work day. 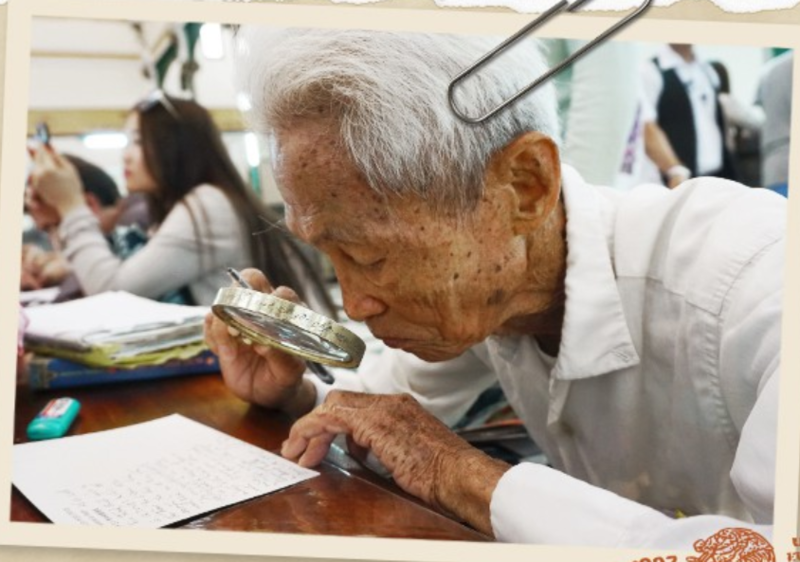 Not surprisingly, visitors to the post office are intrigued by Ngo – his profession a relic of a time when letters were carefully etched onto paper and each pen stroke was cherished. Clemencé, a French visitor, approached Ngo and asked her tour guide, An, to ask him about his life and career. But before An could speak, Ngo, speaking in French, explained that he was fluent in French, English, and of course Vietnamese. The two chatted for a while about Ngo’s past and how he began his career. 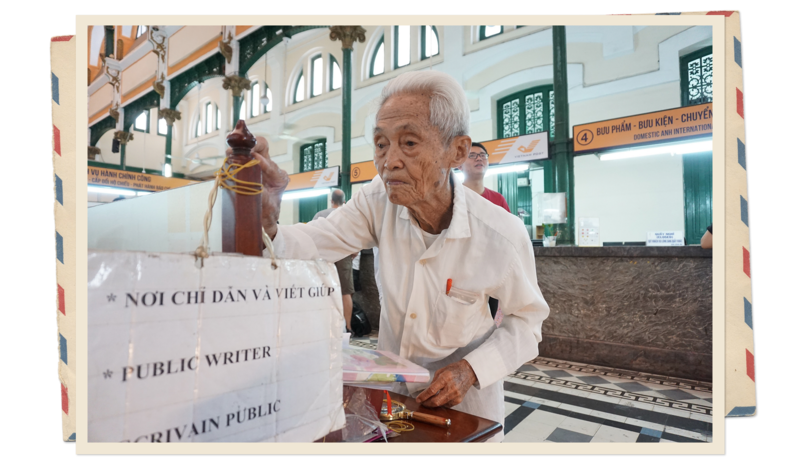 The storied writer shared that he first began dabbling in the post industry in 1946 at age 16 when he began working at the Thi Nghe Post office in Ho Chi Minh City. After two years, he moved to the city’s Central Post Office and worked there until he retired in 1990. But even in retirement, Ngo never truly wished to leave the place where he had spent 42 years of his working. Hence he asked for, and was given, a little corner of the post office where he has provided a letter writing service ever since. “[Being a writer] is my life. Only death can stop me,” he explained. Ngo also described the radical changes he’s witnessed in people’s mail habit over the decades. On the morning that TuoiTre (Youth) Newspaper reporters spent with Ngo, most of his time was taken up by groups of foreign visitors approaching him to chat, take photos, or prepare postcards. About a dozen others asked him for letter translation. “I think I must have written millions of letters over the last three decades,” he said. To Ngo, the most precious thing about his job is the insight it’s given him into the truest of human emotion. Of course, his customers include people from all walks of life, but it is the emotion letters of love and passion that have stuck in his memories over the years. His letters have helped couple’s share their love from across oceans, children find their way home, and mothers connect with their offspring. “It is a must to forget all that I have written, not only out of respect for my clients but also for my own piece of mind,” he elaborated. But there is one particular letter from the 1990s he hasn’t been able to erase from memory. “There was a French man who wrote that the freezing cold of winter could not stop his heart from remembering a Vietnamese lady who he wished to make his partner,” Ngo shared. The writer translated all the letters between the two, up until the day the woman married. “It was heart-breaking to translate their final exchanges,” he shared. Ngo’s devotion to the job means his downtime is spent consulting dictionaries to ensure his translations are on point. “I brush up on my descriptive language every day, but also need to make sure I am able to translate legal texts,” he said. Nowadays, as love letters trickle in slower and slower, Ngo mostly spends his time translating postcards for tourists. In a news article written by a non-Vietnamese journalist several years ago, Duong Van Ngo was labelled a ‘public writer’, a title he is proud to wear. “I provide my service for a price, around VND 10,000-15,000 [US$ 0.43-0.65] per letter. It’s just for fun though. I don’t work for the money,” he said. In 2009, this public writer earned the title of Vietnam’s longest-serving letter writer in Vietnam’s Record Book. 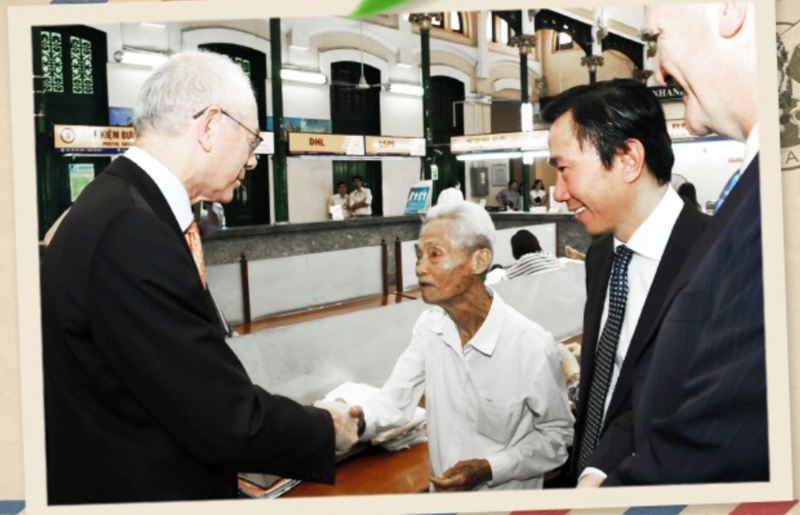 On November 2, 2012, Duong Van Ngo had the opportunity to chat in French with Herman Van Rompuy - President of the European Council - during the latter’s visit to the post office. According to Nguyen Thi Thu Van - Director of Saigon’s Central Post Office - Ngo truly an embodiment of what the post office seeks to do. “He spent his whole life dedicated to the job. And he tells tourists such meaningful stories,” she added. Nearly every tourist to the post office will spare a few moments looking for Ngo, whose old age does worry the rest of the staff. “We just hope that he’ll be healthy enough. That corner, and the whole building, would feel empty without him,” Van explained.